South African Transport and Allied Workers’ Union (SATAWU) fully supports the COSATU-led strike against job losses. Its leaders will be in various provinces on Wednesday to demonstrate. SATAWU President Ntuthuzelo Mhlubulwana will be in the Eastern Cape where marches in Nelson Mandela Metro, Queenstown, Mthatha and King Williamstown are set to start at 9am. General Secretary Jack Mazibuko will join COSATU President Zingisa Losi at the main march in KwaZulu Natal. Deputy General Secretary Anele Kiet will be in the North West province with COSATU General Secretary Bheki Ntshalintshali. SATAWU’s 1st Deputy President, Nkoketse Sepogwane, and National Treasurer, Irene Nthulane, will join COSATU’s 1st Deputy President Michael Shingange in Gauteng. SATAWU is worried about job losses as we saw retrenchments across sectors such as security and passenger bus last year. There were some wins though during wage negotiations, as we convinced management at Transnet and Prasa to put a stay on retrenchments for the duration of the agreements. place of skilled South Africans. Employers do this for the sole purpose of exploiting workers, making them work long hours for very little pay, Moreover, some of the foreign nationals do not possess the requisite skills; this combined with the long hours behind the wheel leads to a rise in road accidents and fatalities. SATAWU rejects this exploitative practice. We are also concerned that thousands of our members who transport coal will lose their jobs if government makes good on its intention to decommission several coal mines as mooted in the Department of Energy’s Integrated Resource Plan. Minister Jeff Radebe’s department has indicated it intends to halve the contribution of coal in the production of energy towards 2030. If this plan comes to fruition, thousands of workers in the road and rail sectors will be affected. 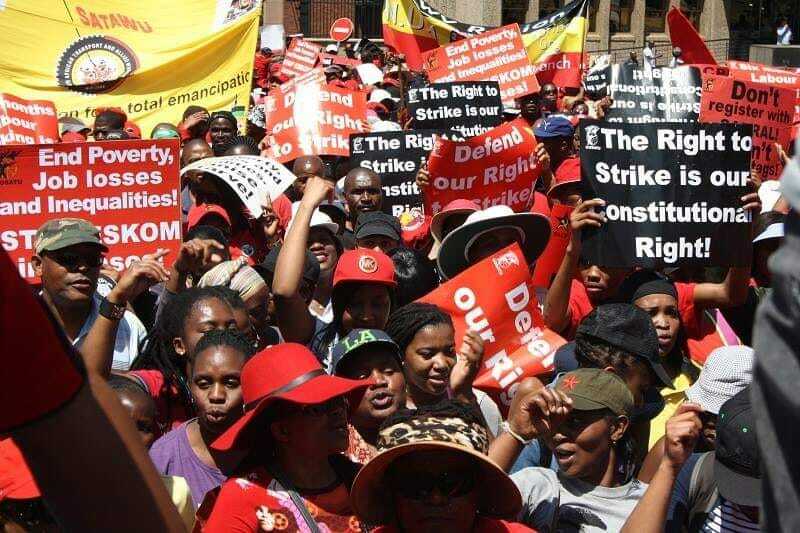 SATAWU members will take to the streets tomorrow along with workers from other COSATU-affiliated unions and other formations to make their voices heard and demonstrate their utter rejection of retrenchments.